Member of the Bromeliaceae (bromeliad or pineapple family). Native of the Tropical Americas. Related species include bromeliads, Christmas cactus, Spanish moss. Leaves stiff, spiny, mostly linear arising from a basal rosette. Flowers borne mostly in spike-type inflorescences. Ananas: modified from aboriginal South American name. Species name “comosus” means long hairs. Often sold as a novelty plant with fruit being present. Most cultivars can survive under a wide range of light conditions. 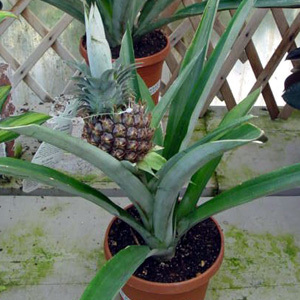 The most common member of this family is the pineapple, other species are grown for fiber but most are grown for ornamental value. This species likes direct or filtered sunlight but can survive under lower light levels.